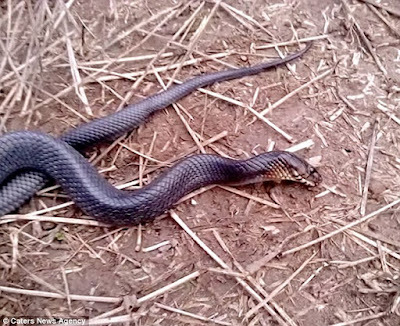 This is the incredibly bizarre and rare moment a snake fakes its own death in a bid to deter potential predators. 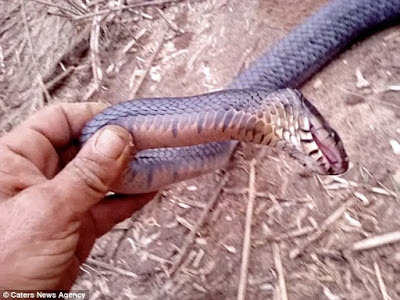 The eastern indigo snake was spotted on the ground in Mission, Texas, USA, by Eric Johnson, who noticed the unusual behaviour. When approached by Mr Johnson, the cold-blooded creature began to squirm vigorously to get away but, realizing it can't, it stopped dead, mouth gaping and contorted its neck to appear as if it is broken. The reptile remains limp and lifeless as Mr Johnson inspected it, but when the self-taught snake expert stepped away it 'came back to life', darting its tongue forward as if nothing is wrong. 'I have never seen anything like this before. 'I'm not sure if this is a defensive mechanism or something to do with an underlying problem in the area. 'This type of behaviour has been sparsely documented in other species of snake, but never to my knowledge in this kind. 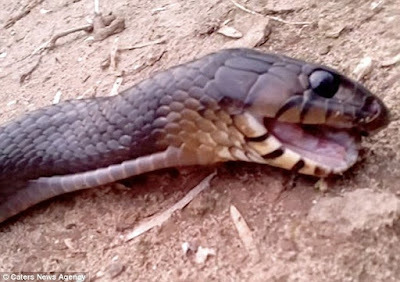 'Even stranger though, as he approached the strange serpent once more and waves his hand over its head, the snake once again returns to its seemingly lifeless state on demand, as if being conducted by his movement.